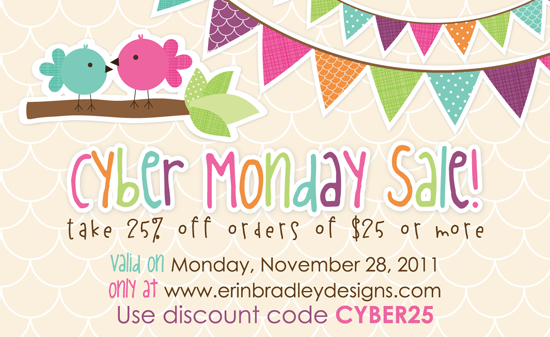 Erin Bradley Designs: Cyber Monday 25% off Sale! Cyber Monday 25% off Sale! Happy Monday! I hope all my US friends had a great Thanksgiving! I was so happy to spend some great, quality time with my family this last week and am sad that it seemed to fly by so fast. In the spirit of Cyber Monday I have a little discount code for you today! Take 25% off of all orders $25 or more with the discount code CYBER25. The discount will be available until midnight CST tonight and it is only valid on my website, www.erinbradleydesigns.com.